If you're a little less of a trick or treater and a little more of a creepy cocktail sipper, then Gotham Grill & Rooftop Bar has the Halloween for you. Kicking off their Costumes & Cocktails celebration at 6:30pm, Gotham will be celebrating all things spooky with curated creepy cocktails, snacks and plenty of entertainment to make for a truly memorable night! Don't be afraid to dress up either, because there's even a prize for the best dressed! So maybe you're after a little less creepy and a little more classy this Halloween - What about a Spooky Seafood Buffet at Citrique in the Marriott? Citrique is opening their doors with a special Halloween-themed Buffet, where you can treat yourself to carefully curated Halloween cocktails while indulging on gourmet delights at their buffet for just $79 per person. Hire a babysitter and go out for date night, or bring your kids along for face-painting and a feast! Ok, so maybe you won't take your kids with you for a Halloween date night... But at least the offer is there, right? Bubble, bubble, toil and trouble... Halloween has come to Oyster Bar! Swap your costumes for cocktails at Oyster Bar's exclusive Halloween night celebration, featuring plenty of curated cocktails and gourmet food to celebrate the creepiest night of the year! Kicking off at 6pm you'll be treated to delicious food paired with one of their exclusive Halloween cocktails, complete with eyeballs and blood for some seriously cool sipping. Just don't forget to reserve your spot - Otherwise you might miss out! We all know Garden Kitchen & Bar are famous for throwing pretty incredible parties for just about any reason, so there was no surprise when we discovered that they're pulling out all the stops for the world's spookiest evening - Halloween! Hosted by luxury Tequila brand Herradura (so you know it's going to be a good night), you'll be (trick or) treated to an evening of eats, beats and treats, with plenty of spooky foods and creepy cocktails to help you really get into the spirit! There will also be Halloween face painting and live body art installations, so don't be afraid to dress up a little - You know you want to! NightQuarter is known for throwing parties basically every weekend - So why should the scariest weekend of the year be any exception? Opening at 4pm, NightQuarter will be bringing all of the goods this Halloween weekend, with plenty of freaky food, creepy cocktails and devilish desserts to satisfy boys and ghouls of all ages! 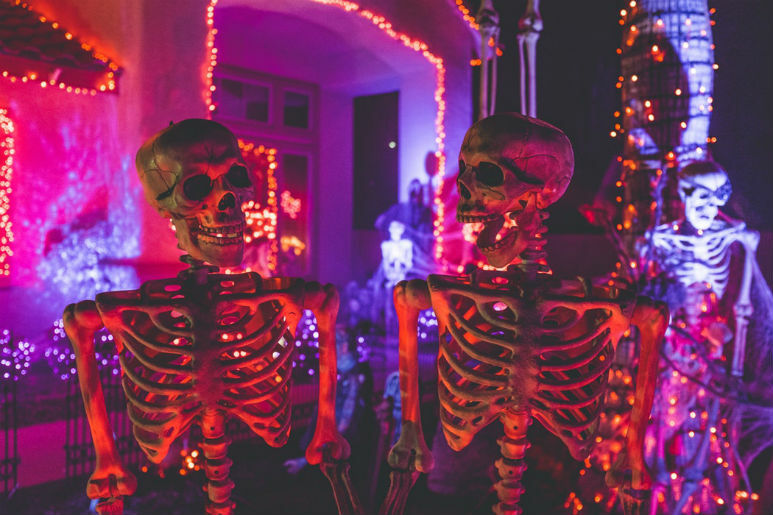 If you're not after the food and drinks (although we highly recommend grabbing some of their Halloween specials for the 'gram), there's also plenty of entertainment planned, with magic tricks, kids fun and even a Zombie Fire Show - Just don't get too close! Family-friendly Theme Park by day - House of Horrors by night. Unless you've been living under a rock, we're pretty sure you've heard about MovieWorld's annual Fright Night events, but that doesn't stop us saying just how cool they are. Running right up until the 28th, Fright Night is the perfect place to go for anyone seeking a serious scaring, with plenty of zombies, ghouls and undead creatures hiding in the shadows of Main Street. Walking down the fog-filled Main Street is scary enough (particularly when multiple zombies jump out at you without warning), but if you're after a true thrill take on one of their many mazes or panic rooms - Just be prepared to scream! What's better than one night of spooking? A whole weekend dedicated to all things spooky! Surfers Paradise Fest-Evil (get it?) is coming to the Coast for the first time ever, transforming Cavill Ave into a wonderland for all things creepy right in time for Halloween. Bring your kids down for a weekend of trick-or-treating, magic tricks and movies, or dress up yourself and grab some tickets to the Surfers Paradise Zombie Walk, where you'll get to live out all of your zombie dreams for a day as you stagger along the front of Surfers Paradise Beach with hundreds of other zombies, ghouls and ghosts!